Printable Leaflet: Protect Glen Cove – PDF format, for 8.5×14 (legal) size paper. Also, theres a grayscale version that will print better on some machines. Print double sided (“short-edge binding”) at 100%. Cultural Easement, Settlement Agreement and Memorandum of Understanding (PDF) – between Yocha Dehe and Cortina bands of Wintun Indians, the City of Vallejo, and GVRD. Signed on 7/21/11. Civil Rights Complaint re: Glen Cove (PDF) – issued 4/13/11 against the City of Vallejo and GVRD. Addendum to Civil Rights Complaint (PDF) – issued April 28, 2011. Letter on Legal Standing of Native American/ Ohlone individuals and SSP&RIT by Alberto Saldamando of the International Indian Treaty Council, 4/25/11. Proposal to GVRD, 16 Points (PDF) – by SSP&RIT and allies, regarding the protection of Glen Cove. Glen Cove Cultural Resources Summary (PDF) – prepared by Miley Paul Holman, an archeologist contracted by LandPeople, the firm hired by GVRD to prepare their Glen Cove Master Plan. A summary of archeological research and disturbance of the Glen Cove site. Includes a detailed chronology and interesting concluding remarks. GARLON 4 Herbicide Safety Data Sheet – official safety warnings from DOW Chemical about this herbicide, known to cause birth defects and tumors and to harm marine life. GVRD has used GARLON 4 at Glen Cove and is planning to use extensively in the future to eliminate non-native trees and plants. Glen Cove “Waterfront Park” Master Plan – by GVRD. Beware of dishonest, diplomatic language. Indian People Organizing for Change – good information on Bay Area Shellmounds. Video: Corrina Gould speaking in San Francisco – on March 6, 2011. Video: Berkeley’s Bones – Ann Marie Sayers (Ohlone) enters the basement of the Hearst Gymnasium at UC Berkeley for the first time, where over 11,000 Native American skeletons are imprisoned in metal filing cabinets – including hundreds of human remains and sacred objects from the Glen Cove site. 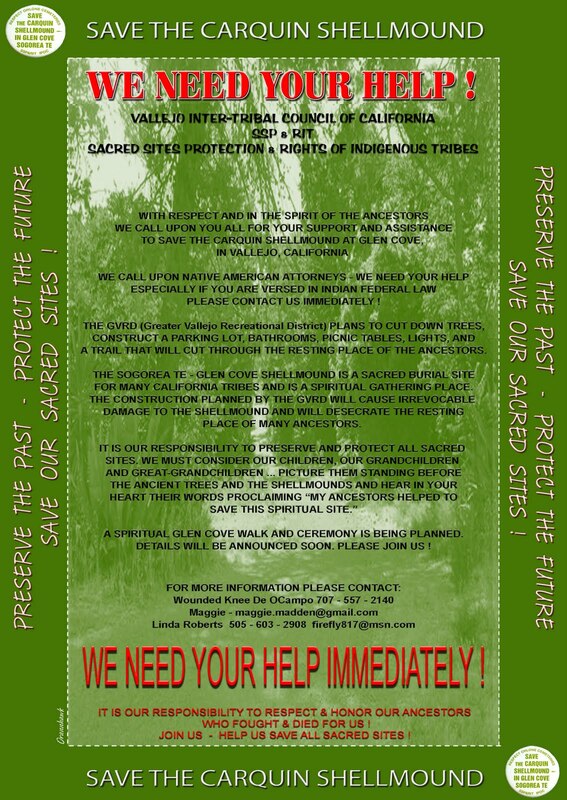 San Bruno Mountain Watch – a decades old community group dedicated to protecting the native ecosystems and sacred burial sites/shellmounds of San Bruno Mountain, just south of San Francisco. Shellmound: the movie – a documentary film about the sordid history of the Emeryville shellmound. Free Land: The Shellmound Story – a film on YouTube in two parts, with Ariel Lucky of the Free Land hip-hop theater project. Great storytelling. I’m an Indian, but Who Am I? (PDF) by Patrick Orozco, an elder of Chumash and Juaneno descent – a story from the book A Gathering of Voices about Orozco’s participation in the 1975 armed occupation at Lee Road in Watsonville, CA (“Wounded Lee”) to protect an Ohlone burial site and how this contributed to his life-long search to uncover his own ancestry and identity. Costanoan Ohlone Indian Canyon – lots of useful articles and research information.